Gilder Lehrman Collection #: GLC04883 Author/Creator: GarcÃ­a de Loaysa, Francisco (fl. 1540) Place Written: Madrid, Spain Type: Letter signed Date: 21 June 1540 Pagination: 1 p. : docket ; 27.8 x 20.8 cm. 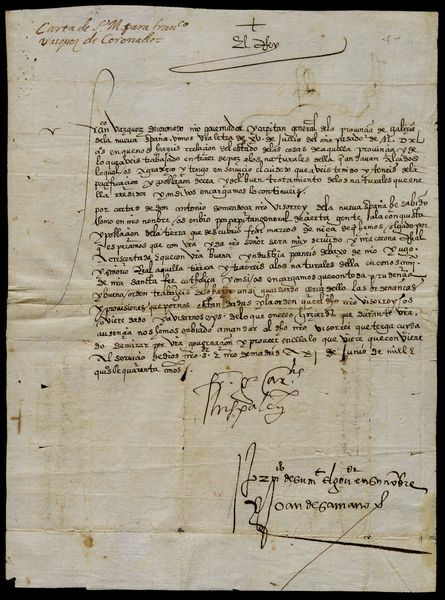 Summary of Content: Written on behalf of King Charles I of Spain (Charles V, Holy Roman Emperor), by the President of the Council of the Indies, Francisco GarcÃ­a de Loaysa. Report of the Niza expedition. Authorizes Coronado's expedition to explore the heart of the North American continent.